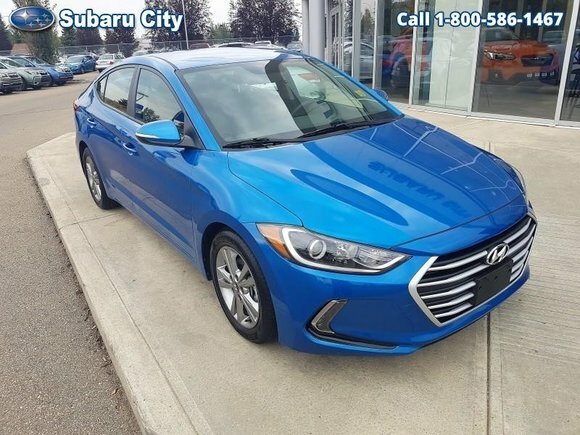 Home > Used Vehicles > 2017 Hyundai Elantra SE,ALUMINUM WHEELS, AIR,TILT,CRUISE,PW,PL,ONE OWNER, FACTORY WARRANTY!!!! - ONE OWNER, FACTORY WARRANTY! 2017 Hyundai Elantra SE,ALUMINUM WHEELS, AIR,TILT,CRUISE,PW,PL,ONE OWNER, FACTORY WARRANTY!!!! - ONE OWNER, FACTORY WARRANTY! ALUMINUM WHEELS, AIR,TILT,CRUISE,PW,PL,ONE OWNER, FACTORY WARRANTY!!!! Hot Deal! We've marked this unit down $3950 from its regular price of $19900. This 2017 Hyundai Elantra is for sale today in Edmonton. The all-new 2017 Elantra is a groundbreaking vehicle, designed to bring new levels of sophistication to compact car customers. Hyundai's engineers set out to achieve a new standard for rigidity with a structure heavily composed of our Advanced High Strength Steel also known as the SUPERSTRUCTURE, which delivers a new level of ride comfort with smooth and precise handling and enhanced safety.This sedan has 23250 kms. It's marina blue metallic in colour. It has an automatic transmission and is powered by a 2.0L I4 16V MPFI DOHC engine. This vehicle has been upgraded with the following features: Aluminum Wheels, Air, Tilt, Cruise. Buy this vehicle now for the lowest bi-weekly payment of $106.51 with $1758 down for 84 months @ 5.99% APR O.A.C. ( taxes included, $790 Administration and Secure Ride included / Total cost of borrowing $3565 ). See dealer for details. Want to try the 2017 Hyundai Elantra SE?